grandma's cookie jar: Tell the Next Generation - What Grandmas with Heart is all About! 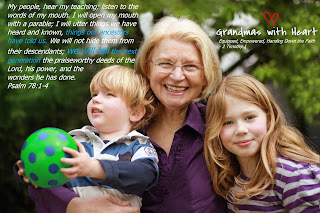 Tell the Next Generation - What Grandmas with Heart is all About! These verses are what Grandmas with Heart is all about - we want to help equip and empower you to hand down the faith - "tell the next generation" about the amazing things God has done! Make time today to tell your grandchildren - in person, over the phone, in an email or a "snail mail" the "Praiseworthy deeds of God, His power, and the wonders He has done!" If your grandchildren are older, consider giving them a nice, small three-ring notebook and then mail - yes, snail mail - them a page each month where you share your family history of how God has shown His great love, the things He is doing in your life and your prayers for them. Over time, as they fill their notebooks each month, the will have a treasure - one to be handed down to the generations who follow them as they "tell the next generation" as well! Please share this with the people you know and help spread the news about Grandmas with Heart - thank you!